Elevate your morning cup of coffee with the Baratza Virtuoso burr grinder! Equipped with a redesigned burr-stabilizing mount, 40 stepped grind settings, and a timed dosing functionality, the Virtuoso is an easy choice for coffee enthusiasts. And, its stainless steel face, anti-static grounds bin and easily-removable hopper offer effort-saving after-thoughts sure to make your cups taste just a little bit better. Complete Control - With more than 40 individual settings, the Virtuoso will enable you to dial into your specific grind. Push Some Buttons - With both a pulse button and timer, it is easier to keep consistent quantity for multiple grinds. Less Static - The Virtuoso boasts an enhanced anti-static design, which minimizes messy coffee dust. European-Crafted Burrs - The Virtuoso conical burrs ensure consistency every time you grind. Earth-Friendly Packaging - Packaged in 100% recyclable materials. Large Hopper - With an 8-ounce hopper and a five-ounce ground bin, make plenty of coffee with one flip of the switch. Range and Accuracy - The Virtuoso has 40 distinct settings of grind. Consistency - The 40mm commercial-grade hardened steel conical burrs produce a consistent grind, which is crucial for perfecting your favorite brewed method. Less Noise - A high-efficiency motor is powerful and spins slowly, resulting in cool and quiet operation. Gets Warm - While the timer feature is nice, if it is left running for the full minute, the machine heats up, causing your grind to come out a bit warmer than usual. Can Be Messy - Some customers have indicated that the excess grinds get all over their countertops and the exterior of this unit. The Virtuoso grinds from 200 to 1400 microns. 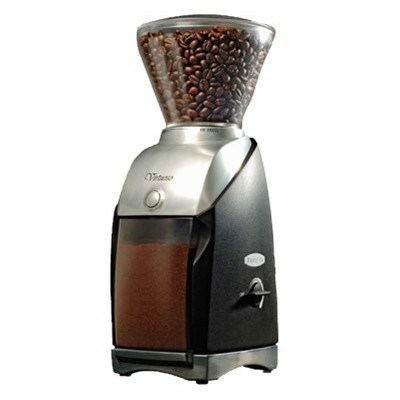 It is a good all around grinder choice for any slow-brew method. This grinder is compatible with the Baratza Esatto accessory for weight based grinds. Compatible with the bean hopper extension for additional capacity. Notes: Baratza has excellent troubleshooting resources on their website. If you're experiencing an issue with your grinder, definitely look here first. Clean burrs on a weekly to bi-weekly basis either with a cleaning brush or a burr grinder-specific cleaning product such as Grindz. Remove and hand wash the bean hopper and lid with warm water and soap as needed.